The Rambling Shadows Jacket is fini!... well, that's not quite technically true. I still need buttons. Changes to the pattern: Nothing technical, but I goofed on the lower front panels (the decreases go in the opposite direction to how the pattern is written. I don't think it matters for what I was doing...) oh, and I think I may have put the buttonholes on the wrong side (oops). 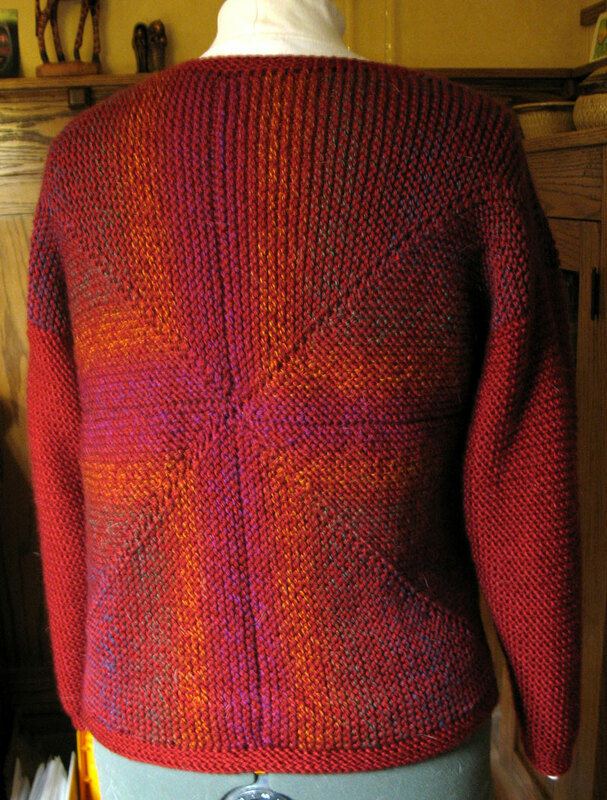 I did use a smaller needle for the ribbing than the pattern suggested. Design Notes: I used the Simply Shadows for the body and the Simply Soft for the sleeves and the buttonbands. I didn't have much of the Simply Shadows yarn (and I ended up needing 5 skeins, with not a lot leftover), so I didn't bother trying to do any color matchinig up. That's the way the yarn came out of the skein. Overall impressions: This is exactly what I had in mind. It was fast, cheap and easy. It's cozy and comfortable and I'm very pleased with how it turned out. I would do this pattern again in a heartbeat. I plan on using this sweater around the house, so I wanted something fast to knit, in inexpensive yarn that I could toss in the washer and dryer. I also wanted it soft. This absolutely fits the bill. As I said, I had been a little suspect as I got the body done, as the garter stitch was all stretched out. However, I'm now very happy with the fit and the style. I'll give the project a thumbs up. Wow, I love this one. 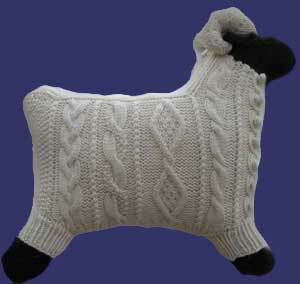 It will make a great house sweater. What size does this pattern go up to? Should I consider purchasing it? Wow, Cindy - that's absolutely gorgeous!! Just caught up on your posts. I'm sorry Fawne didn't work out. Your progress photos are gorgeous!! I hope at some point you take her out of the bag and can face finishing her. I'm on camisole 3.0 myself, currently ripping back. I started this during last year's Tour, sigh. 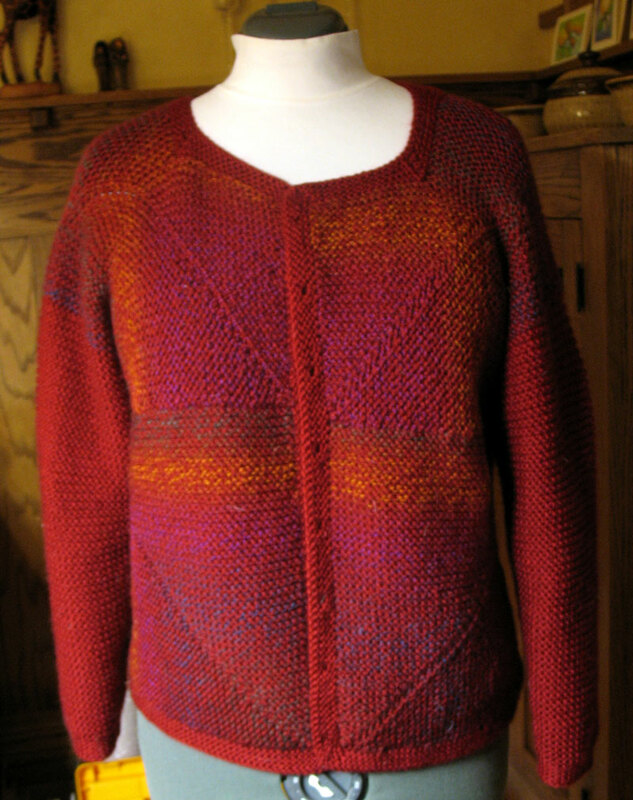 Your jacket is lovely, as is the Shoalwater Shawl. Matt's sweater looks great too! I need to finish some knits too...everything I'm working on is for summer and the temperatures have already dropped here. I refuse to have more than 3 WIPs, though, so I won't start a fall project yet. Don't you love a dreary Monday morning? Directions? I don't need no stinking directions!